Patrice DÃ©silets once guided the Assassin's Creed series to its targets, but will now be killing for an Ubisoft competitor. Patrice DÃ©silets, the creative director for titles such as Prince of Persia and the Assassin's Creed series, left Ubisoft Montreal after 13 years of service back in June. At the time, DÃ©silets departure was labeled a "creative break from the industry." It's now been revealed that DÃ©silets actually just headed across the street to THQ's Montreal studios. In an open letter about the move, DÃ©silets says he will be running his own label and development team at THQ. It certainly sounds like a step up from the position of creative director. DÃ©silets left Ubisoft as he was working on Assassin's Creed: Brotherhood. 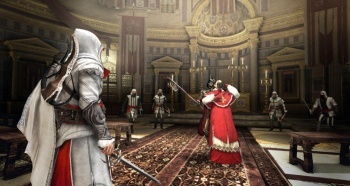 Series producer Vincent Pontbriand told CVG that the move was a "shocker" to Ubisoft, but ensured Assassin's Creed fans that the franchise would be okay. "He didn't come up with all the ideas himself, there is a fifteen person core team," Pontbriand said. "We're fine." In a move that DÃ©silets says is partially out of "respect" to Ubisoft for giving him a break in the videogame industry, he won't be working on anything new at THQ until the summer of 2011. He says this is also due to "various" other reasons, so there could be a non-compete clause at work here, but that's just my own speculation. For now, DÃ©silets remains in "creative hibernation," but he plans to bring big news to E3 2011. There must be something about the time period of 13 years that makes developers want to move on, because 13-year LucasArts veteran Haden Blackman also recently struck out on his own to form Fearless Studios. Opportunities in the videogame industry aren't exactly known to be given away, so I suppose if they pop up you have to grab them.